hi! I am from Austria and moved to Sligo recently - what a wounderful part of Ireland! I love dogs, music, cinema, theatre, walks by the sea and much more. Would be great to meet someone nice! suevienna is a Female dating in other, Germany. 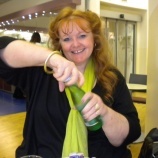 Check the description of this 57 years old profile, she is White/Caucasian and Non Religious maybe this matches your profile description and you can both start dating in Ireland for free. The stars says she is a Gemini maybe you should check your horoscope and match up your star sign.